Welcome to the release of Gloomy Salad Days! It’s definitely not your usual idol drama. Gloomy Salad Days is a collection of short stories based on real life news events. The term “salad days” refers to one’s youthful time of inexperience, idealism, and innocence. In the drama, the word, “Du” (渡), literally translates to “crossing”. Serena Fang’s character, Du, is the guardian of the Bridge of Helplessness in which she helps the souls of the dead to cross over to the other world. The drama often mentions the line, “渡不過” (not able to cross), which is when one cannot overcome/get over their own challenges or let go of certain issues in life. At times like these, Du would offer her help, but in exchange, the individual would turn into a rock to support her bridge. When it’s their time to go, Du becomes Death to take their life away. Please note that the drama contains a mature subject matter, viewer’s discretion is advised. We are definitely looking for better RAWs for this drama, if you have them, or know where to find them, please let us know. 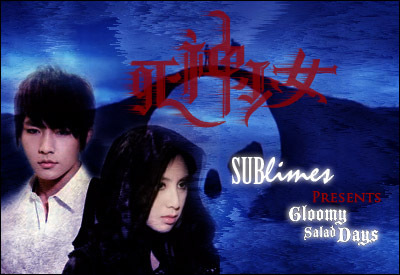 If you are interested in helping us translate for the drama, please contact us at sublimesfansubs AT gmail DOT com !